Full of tasty gourmet goodies your special recipient won't be able to resist, our Daisy Delights Gourmet Tower of Treats is a bright and beautiful way to send your love and appreciation near and far! 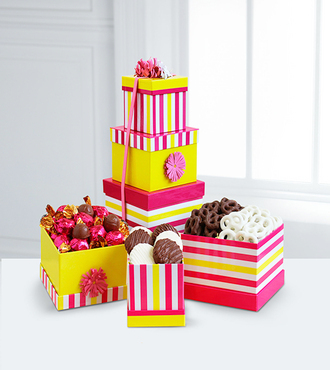 Yellow, pink, and white striped gift boxes with pink daisy accents arrive loaded up with the following sweet treats: Godiva Milk Chocolate Truffles, Chocolate Covered Pretzels, White Chocolate Covered Pretzels, Chocolate Covered Oreo Cookies, and Milk Chocolate Covered Oreo Cookies. Arriving tied together with a pink ribbon to create a fun and inviting presentation, this gourmet tower of treats is ready to celebrate a birthday, Easter, or Mother's Day.